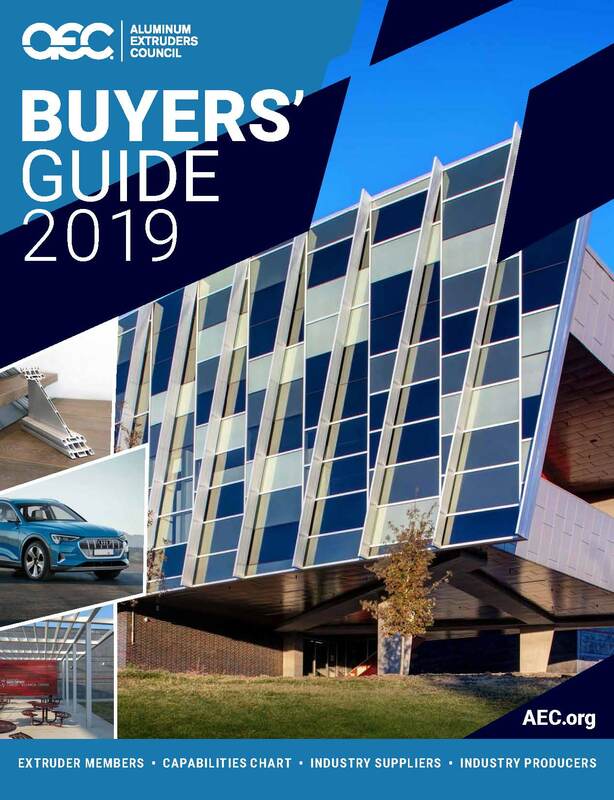 Wauconda, Illinois; March 15, 2019 -- The Aluminum Extruders Council (AEC) has released the 2019 edition of its popular publication, the AEC Buyers Guide. As a comprehensive directory, the Buyers’ Guide contains listings of AEC Extruder Members, which feature such information as company headquarters, plant locations, contact information, maximum press circle size, forms produced, and types of services offered. The guide is organized in a convenient format, arranged alphabetically and geographically, and includes an extensive capabilities chart. The Buyers’ Guide also includes listings for AEC Supplier and Producer Members. The Buyers’ Guide offers valuable content that provides readers with interesting facts about aluminum and aluminum extrusions, including an article, “Aluminum Extrusions: Helping Designers Meet Time, Cost and Weight Challenges," showcasing the flexibility of aluminum extrusions that offer limitless design potential for a wide variety of industries. An essential reference tool for designers, engineers, specifiers, and purchasers of aluminum profiles, the AEC Buyers’ Guide is one of the most requested publications provided by AEC and is available in both printed and electronic formats. Readers can download and view the free e-Book version at AECguide.org. In addition, printed copies of the Buyers’ Guide will be available at trade shows and events in which AEC participates this year. The AEC Buyers’ Guide is available at no cost. To view online or request a printed copy, visit AECguide.org. Visit the AEC newsroom for more news. The Aluminum Extruders Council (AEC) is a progressive trade association dedicated to advancing the effective use of aluminum extrusion in North America. AEC is committed to bringing comprehensive information about extrusion's characteristics, applications, environmental benefits, design and technology to users, product designers, engineers and the academic community. Further, AEC is focused on enhancing the ability of its members to meet the emerging demands of the market through sharing knowledge and best practices.